The Uganda Railways Corporation will on April 27 test the rehabilitated Port Bell to Kampala Railway Station line with a cargo train. The Uganda Railways Corporation (URC) will on April 27 test the rehabilitated Port Bell to Kampala Railway Station line with a cargo train as part of ongoing plans to open new transport corridors. The URC senior marine officer Charles Ruzigye has said that the government has already invested about Shs 1 billion in rehabilitating the line from Port Bell to Kampala that has been inactive since the year 2007. "We have replaced the rails and sleepers and we plan to have a trial run for a cargo train from Port Bell in Luzira to Kampala on April 27th this year," Ruzigye told journalists this week. The project which is part of the Central Corridor intends to improve movement of cargo to and from the port of Dar es Salaam through Mwanza port in Tanzania. Ruzigye said the trial "is aimed at checking the strength of the line that will connect Port Bell to Mwanza, thus transporting cargo from Kampala to Mwanza and ultimately to the Dar es Salaam port". He said at a media briefing organised by the Central Corridor Transit Transport Facilitation Agency (CCTFA) media coordination office in Kampala that since 2007, Uganda has had no transport activity on Lake Victoria. Lake transport took a hit after the 2005 accident in which the MV Kabalega sunk. In the early hours of May 8, 2005, two marine vessels, MV Kaawa and MV Kabalega collided on Lake Victoria while transporting goods to and from Tanzania. MV Kabalega capsized two hours after the collusion while MV Kaawa was rescued by marine forces. The vessel sunk about 150 feet between Kuye Islands in Mazinga Sub-county and Bukasa in Kyamuswa Sub-county. He said a commission of inquiry was set up and it recommended that both MV Kaawa be rehabilitated in 2012 and issued with new certificate of worthiness. However, this was interrupted by the privatisation of the railway network when the contract was awarded to Rift Valley Railways (RVR). "So in July last year the two governments of Tanzania and Uganda signed a Memorandum of Understanding on joint ministerial cooperation and improvement of ports, inland waterways and railway transport in order to increase transit trade". The memorandum was signed at Dar Port by the Tanzania's Minister for Works, Transport and Communications Prof. Makame Mbarawa and Uganda State Minister for Transport Aggrey Bagiire. The agreement is establishes the re-opening of multi-modal transport through the use of trains and wagon ferry services. The Central Corridor that starts from Dar es Salaam port in Tanzania to the hinterland includes routes in Tanzania, Uganda, Rwanda, Burundi and the Democratic Republic of Congo. "As we plan to open the Central Corridor starting from Kampala, the Tanzania government has already provided MV Umoja while Uganda already has got MV Kaawa," Ruzigye said. Each marine vessel can carry 880 tonnes of cargo per trip and is capable of making eleven voyages in one month. He said that the ferries that carry 44-20ft containers take only 17 hours from Mwanza to Port Bell. 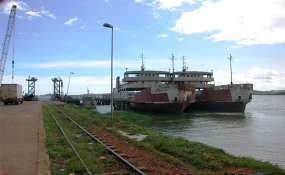 "Government is also looking for between $4 - $5 million to rehabilitate MV Pamba that has been docked at Port Bell since the year 2005," he explained. "To activate the memorandum, Tanzania has already started operations of a block train from Dar es Salaam to Mwanza," he said adding that the only thing holding back connection to Kampala has been the Port Bell line. He explained that URC, Tanzania Ports Authority, Tanzania Railways Corporation, and the Marine Services Limited of Tanzania have come up with affordable tariffs as an incentive to the traders. Port Bell used to handle 600,000 tonnes of cargo but this had dropped to about 10,000 tonnes. This is expected to improve as infrastructure in the central Corridor is re-ordered including the opening of the one stop border post at Mutukula. Tanzania Port Authority (TPA) Director General Eng. Deusdedit Kakoko said container rates for the Ugandan traders will also be reduced. Those who will start using the route from Port Bell to Dar port will benefit from the reduced rates during in May. "The revised rates will be $60-$70 per tonne for containers from Uganda transported through Port Bell in Luzira via Mwanza to Dar Port, while containers from Dar Port via Mwanza to Kampala will be paying $75," Kakoko revealed. For his part, Dukundane said in a report released recently that the road network in Tanzania has steadily gotten better. "A quality road network is operational through the corridor between Dar es Salaam and Kampala and is now extensively used to move cargo with a cargo delivery time of four days to Kampala, while the weighbridges between Mutukula and Dar es Salaam have been reduced to only three from eight," he said.